3D SCANNING FOR NEW BARRELS? Can modern 3D design and scanning processes be used to make new barrels for old classic shotguns? While researching prototyping processes for a design (see here for the design: http://oplognosia.com/?p=7590) I got my first glimpse at the possibilities of 3D design, modelling and prototyping. When the 3D printed monoblock clicked into the receiver and the barrels locked with minimal fitting, it was impossible not to ask the obvious: can this process be used in rebarreling old side by sides? The opening photo shows the 3D drawings from that initial design. They were used to make the ABS on a 3D printer and it fit very nicely into the receiver. Scanning a receiver with laser scanners seems to be the first logical step. The scan of the action yields the starting data for the barrels. The process is already being used in scanning molds. From the mold scans a 3D virtual model can be created and examined on the computer screen. Some modellers are already using the process in the reverse, they design the object in 3D, something like a virtual casting plug, and from that they proceed to design the mold. 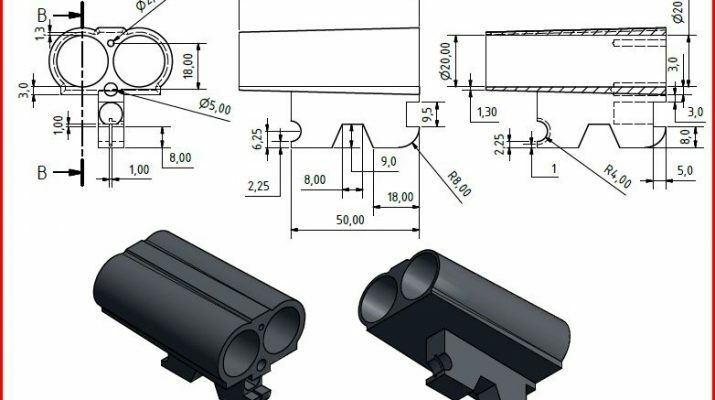 Scanning the receiver will give the distance between firing pins hence the centers of the new barrels, lump dimensions, cross pin location and other critical data. It is possible to modify the initial 3D design and increase certain dimensions so as to allow for final fitting and smoking-in of the barrels. Scanning is very accurate, it can provide dimensions way more accurate than needed for a tight action to barrel fit. Looking at the auction prices fetched for a classic shotgun with scrap barrels the possibility of creating new barrels at a reasonable cost and at a fraction of the time seems attractive. However there are some perceptible negatives. The process favors monobloc barrels rather than chopper lump. Extracting the data from an action scan and transferring them to a 3D design of a monobloc is an intuitive process. From the monobloc scan it is a simple step to make the actual monobloc in a CNC mill and fit new tubes. And therein lie the problems. 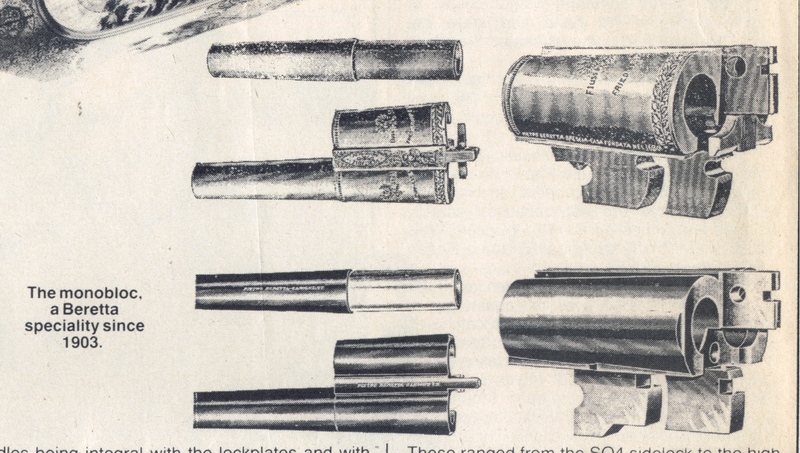 Few best guns afficionados would be willing to accept a Holland with monobloc barrels, especially if they «can see the joint». Even barrels made from top quality Boehler Super Blitz steel would not overcome this prejudice. More substantial problem is the width of the barrels at the front end of the monobloc. 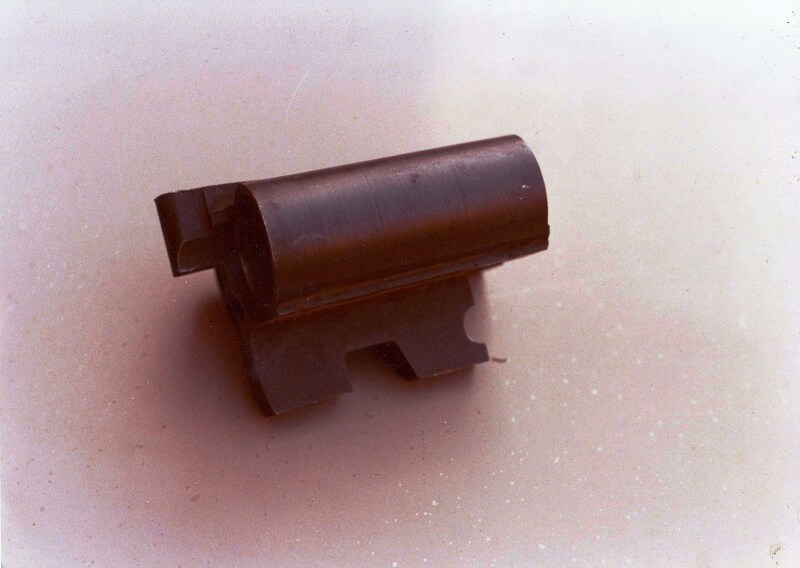 In chopper lump and dovetail barrels it is possible to have thin inner walls, where the tubes touch because the subsequent brazing fuses the two barrel walls into one central wall. This is made possible by the strength of the braze. Consequently barrels are filed flat on their inside surface and brazed together, yielding a pair with slightly narrower dimensions than is possible with a monobloc. Details of the early Beretta monobloc system. The tubes are turned and must have full contact with the monobloc on all the step circumference, hence monobloc barrels tend to be slightly wider at the chamber end area. In monobloc construction there can be no filing the inner surfaces of the barrels. The tubes must have intact steps on the whole circumference where they will meet the monobloc. The difference is small, maybe a millimeter or so. It is interesting to ponder whether such a slight difference would become unnoticeable if accompanied by a sizable cost saving. The difference in cost cannot be overlooked. A new set of monobloc barrels made from top quality certified steel can cost less than sleeving and way less than rebarreling, but it would have the tell tale joint of the monobloc. Roughly machine monobloc for a Manufrance Robust. The compact dimensions of the monobloc make it suitable for CNC machining, more so than a full set of chopper lump barrels would be. The idea might sound like a boon or a curse depending on your point of view. To some anything but chopper lump barrels laboriously hand filed and smoked-in on an English gun is sacrilege. To others, light weight, virtually stainless barrels at an affordable price are a blessing.